When your spouse/significant other loses someone close to them, it can be hard to understand what they are feeling or going through. You might be at a lost on just how to help them through their grieving or what to say. When I lost my mom, there were all the stages of grief present. Anger, hurt, resentment. It was Brian that was there and helped me through it and still has to help through some days. 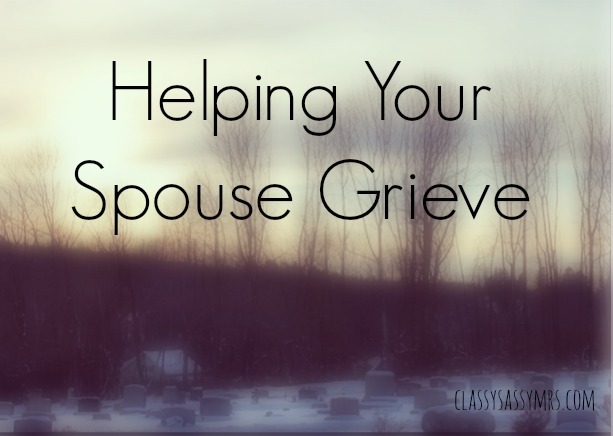 It can be hard to be in these shoes, there are certain ways though that you can help your spouse get through the grief. Let your spouse talk about their loss and talk about the person. It will help to be able to share stories and upsetting moments to deal with the grief. Listen to them if they need more support than usual or maybe just time alone. When it comes to grief, there is no black and white on how to grieve. One day it might be sadness. Another day it might be anger. Another day it might be euphoria and going through all the childhood pictures. Grief can be dealt with in many different ways. Sometimes it will be the grief talking, don't take it personally. When you know it might be hard time for your spouse, do some nice things to let your spouse know you are there. Take a chore off of their plate. Cook them an extra special dinner. If they snap at you, give them an extra hug. Helping them lets them know you acknowledge this is a hard time and want to help them out. Days where they might wake up and just be sad that person isn't there. They will be at a loss when it comes to big moments in their life and on special occasions like birthdays, holidays, etc. It will get easier but will still be hard at some moments. It's good to ask how how the person is doing, if they need anything, just telling them you are there. Your spouse needs to hear that you are trying to understand what they are going through, know that it takes some time but you are there. It can be hard for a husband/wife to understand the loss their spouse is feeling if they haven't been through it. And even if they have, everyone grieves in a different way. It's just important to make sure they know when things are hard, you will be there for them. This is great advice! I think a big thing is knowing when to talk and when to simply be there. Great tips! I have been with my husband through a couple losses and I remember the first one it was really interesting to see how he responded--definitely not a fun thing to go through... but it made us tighter for sure.